[tps_footer]Deepika Padukone and Ranbir Kapoor starrer film ‘Tamasha’ is all set to hit the screens today. The film which was much in limelight for its star cast has finally released smoothly. 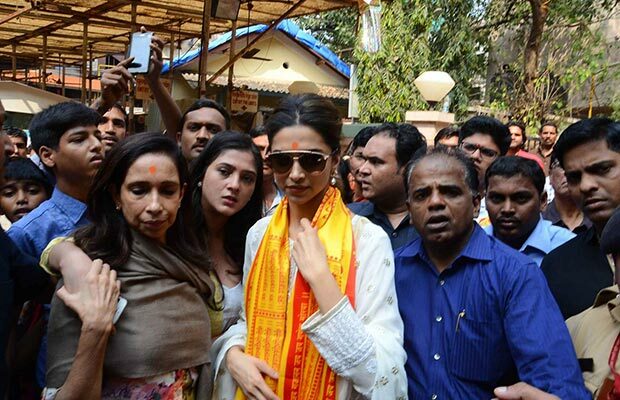 Well, just before the release of the film, Deepika headed to Siddhivinayak temple to seek blessings for the film. The actress who is known to be grounded, paid a visit to the temple with mother Ujjala. The film directed by Imtiaz Ali was much awaited by the audience and is expected to fetch a good box office collection. Deepika Padukone was snapped in a white toned ethnic wear with mother Ujjala. The mind blowing actress looked simple and teamed up her white kurta with palazzo pants. The actress was seen wearing delicate earrings to complete the look. The diva created a lot of fan frenzy on her way to the temple. The happy go lucky film has already impressed everyone with its unique music. The movie will also feature the scenic location of Corsica. Nevertheless, the highlight of the film is its star cast. Deepika Padukone and Ranbir Kapoor made headlines during the promotion of the film. The two were spotted at every nook and corner of the city. Recently the two talent bundles took a unique promotional stance by travelling in a train. With vigorous attention gaining promotions, and wonderful songs, ‘Tamasha’ is expected to see a good number of audiences at the screens. The promos of the film are different from the norm which adds up to the curiosity. Directed by Imtiaz Ali, ‘Tamasha’ will see the amazing duo of Ranbir Kapoor and Deepika Padukone in a romantic avatar. The two will share screen space after their blockbuster film ‘Yeh Jawaani Hai Deewani’. ‘Tamasha’ has hit the screens today, now whether this film creates a charm at the box office or no is too soon to tell. Also Read: 10 Upcoming Bollywood Biopics To Watch Out For! Next articleWatch: Spectre Kissing Scene Which Censor Board Deleted!